Feeling tired, frustrated, and overwhelmed with work chaos? 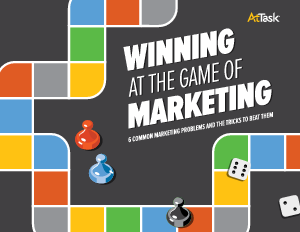 Get the Winning at the Game of Marketing ebook and get control. Marketing is like a real-life board game. You could get sent backward, move ahead or lose a turn at any moment. Often unpredictability and chaos abound, making work more a game of chance than strategy. While the project goals and individual tasks may change, the process stays the same—hold a kickoff meeting, develop a plan of attack, assign tasks, and set a completion date. Then, roll the dice and hope for the best. Find out how to eliminate marketing work chaos and gain control of the board. No more rolling the dice. It is now a game of chess, where creativity and strategic execution are the keys to winning. "When you change marketing from a game of chance to a game of strategy, you will win every time. The best strategy is enterprise work management—a unified process that manages all work activities, with full visibility and two-way collaboration for everyone. Enterprise work management is your game changer."